A highly accurate and reliable power and energy meter, the PowerLogic ION7400 utility feeder meter offers flexibility and usability. 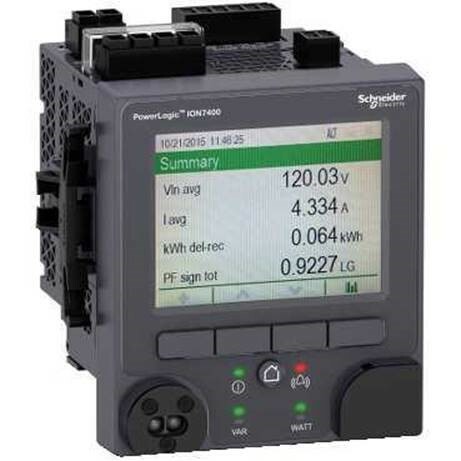 The meter combines accurate 3-phase energy and power measurements with data logging, power quality analysis, alarming and I/O capabilities not typically available in such a compact meter. It provides a high degree of visibility to data and assets that allows for cost savings, rapid response time, and better decisions. Improve operations and profitability of your facility with this easy-to-install, easy-to-operate meter. Software integration provides user-friendly, remote access to energy data, power quality disturbances, forecasting, and more from customizable web pages. The PowerLogic ION 7400 utility meter easily fits into existing billing or SCADA systems, and provides industry leading cost management and power quality monitoring. Patented ION technology inside and flexible communication options allow for customizable, scalable applications and increased adaptability.